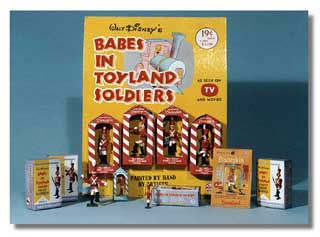 The BABES IN TOYLAND Series of Disneykins was introduced in 1961 with the release of Walt Disney's live action film BABES IN TOYLAND, starring Annette, Tommy Sands, Ray Bolger and Ed Wynn. Although this Disneykin series featured only eight slightly different soldier figures, it holds interest today with the strange scene boxes, flats, and packaging formats. To make matters more confusing, the soldiers were marketed in two sizes; Disneykin-miniature and larger 60mm size  each with similar packaging. For more information see the listing in the Disneykins Database. This group product shot shows the variety of packaging for the eight soldiers in the series. Each named soldier was sold in their two sizes as well as in at least two individual box formats in each size. Shown from left to right are: the 60mm soldiers in grey boxes (set of 8), the "Guard House" boxed 60mm soldiers store display (set of 4), a miniature blue & white Disneykin soldier "Guard House" box, and an orange blister card with Disneykin-size miniature soldier. Larger playsets and TV-Scene boxes were also available, as well as a "gift" box set. Click photos to view a larger version. The Grey & Yellow Closed Box (l) and The Large Guardhouse (r). The "Ship Scene" -- one of six playsets with HO scale figures. A blister card with one BABES IN TOYLAND Disneykin and collector card.